Nova’s first holistic rebrand in five years is about giving the radio station owner the opportunity to reinvigorate and strengthen its standing with the under-40s consumer market, its CMO says. The rebrand was unveiled on 3 February, and kicked off with on-air programming and fresh logo and branding across owned assets including digital, social and mobile. It is being supported by an extensive national marketing and media campaign across TV, social, consumer and trade media from 5 February.Nova has also introduced a new Apple Carplay app to market, claiming to be the first local radio station to do so. Nova chief marketing and digital officer, Tony Thomas, said significant changes in audience behaviour as well as the marketplace and competitive landscape in recent years made it a good time to kick off a rebranding and connect back in with audiences. Nova’s rebrand comes off the back of an extensive consumer brand study aimed at understanding consumer brand beliefs as well as the marketplace generally. Thomas said one key insight revealed through the research was that consumers wanted a 360-degree connection with brands. Another insight was that the Nova brand is a strong holistic media brand, Thomas said. Thomas said the Nova brand of 2017 is a more all-encompassing entity than it was five years ago, with an audience of 3.5 million listeners every week across its radio stations. “That has allowed us to extend through our live music brand, the Red Room, providing a physical experience,” Thomas continued. “And across our digital assets, we’re providing all sorts of content across there as well as social, giving audiences that deeper experience of our brands. 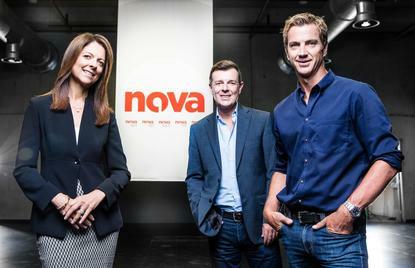 Internally, the rebrand has given the Nova team a set of clear brand principles to filter through all activity, and a strategic platform for all content, Thomas said. He outlined four key pillars supporting the brand strategy which although not new, have been given strength through the rebrand exercise. The first is celebrating music with passion, while the second is highlighting the “unique” power of live. The third core principle is to reflect the vibe of the city. “It’s one of the basics of radio but it’s important for us to own all elements of the city through partnerships, live and community events and to be everywhere in the city people are,” Thomas said.The last core brand principle is to “brighten people’s days”, something that’s reflected in its humorous and irreverent approach to broadcasting content, its on-air personality and delivering experiences to consumers. The media approach is also different in terms of both spend and execution. As well as above-the-line activity across major media channels such as TV and out-of-home, Thomas highlighted the rising volume of content Nova is generating and pushing outside of live radio into owned and paid social and digital channels. The structure of the marketing team and agency relationships has had to adjust as a result. “We do more planning and execution in-house – we have a media manager doing planning and working with our agency jointly to execute, then we have designers in-house, videographers and we do come up with a lot of ideas in-house,” Thomas commented. “We utilise experts to then help produce those ideas for us.